The San Diego Union-Tribune provides my editorial submission on the public school districts in San Diego County. For Orange County, see MOORLACH UPDATE — Get Mad, Get Motivated — October 19, 2018. For Riverside County, see MOORLACH UPDATE — Riverside County School Districts — October 31, 2018. For San Bernardino County, see MOORLACH UPDATE — San Bernardino County School Districts — November 5, 2018. For a sneak peak at San Diego County, see MOORLACH UPDATE — San Diego County School Districts — November 7, 2018. For a complete overview, see MOORLACH UPDATE — Public Schools Financial Crisis — November 3, 2018. With the Legislative Analyst’s Office projecting another year of surplus revenues this week, and a new Governor come January, it will be interesting to see what Sacramento will do to financially assist its strapped school districts. Only one of 42 public school districts in San Diego County enjoys a positive balance sheet, Spencer Valley Elementary in Santa Ysibel. The balance sheets of the other 41 districts are dipped in red ink, some substantially. The scoring comes from my recent report, “Financial Soundness Rankings for California’s Public School Districts, Colleges & Universities.” It reviewed the financial soundness of all 944 California public school districts. That’s the number you want: the Unrestricted Net Position, or UNP. The number will either be positive or, with parentheses around it, negative. I also divide the UNP by the district’s population to get a per-capita UNP. If negative, that’s the amount each person in the district is in hock for, whether or not your children attend school. Citizens should be concerned about the trajectory of these negative balances, commonly attributed to unfunded pension liabilities. If the negative number runs too high too long, it will mean cuts in teachers, equipment, band and sports, and ultimately calls for parcel taxes and more statewide tax increases like Proposition 30. In the worst cases, takeover by the state is not out of the question. Spencer Valley ran up a positive UNP per capita of $8,007, the 11th best in California. Great. Unfortunately, after that every district ran negative UNPs per capita. The second “best” in San Diego County was Julian Union Elementary at -$147, 153rd best in the state. Following were San Marcos Unified, in third place in the county at -$150, and 156th best in the state; and Warner Unified, in fourth place in the county at -$201, ranking 172ndbest in the state. Half of San Diego County’s districts scored in the top half of the state’s 944 districts. That at least is a better performance than for districts in the nearby counties of Orange, Los Angeles, San Bernardino and Riverside. What’s of greatest concern is the bottom of the list. In 42nd and last place for the county was Cardiff Elementary, at -$2,139, 912th among the 944 state districts. In 41st place for the county was Valley Center-Pauma Unified, in Valley Center, at -$1,756, ranking 894th in the state. Of special concern is the most populous district: San Diego Unified’s UNP per capita is -$1,381, fifth-worst in the county. But here’s the sticker shock: The UNP itself is -$1.5 billion. The only district even deeper in the red in California is Los Angeles Unified, at -$10.9 billion. I also have scored the balance sheets of the state’s 58 counties and 482 cities. San Diego city bleeds -$1.6 billion in red ink, -$1,122 per capita. The county bleeds -$1.2 billion in red ink, -$347 per capita. Add up SDUSD, the city and the county, and the geyser of red ink amounts to $4.3 billion, or -$2,850 per capita. For a family of four, that’s -$11,400! Next year, the Governmental Accounting Standards Board for the first time will require that balance sheets include unfunded retiree medical care liabilities, which will show even more city and school districts in critical condition. It’s time for school district leaders to develop 10-year strategic financial plans that are well communicated to their constituents. You need to know how your district plans to move up its position in the objective ranking. Moorlach, R-Costa Mesa, represents the 37th District in the state Senate. A CPA, he was Orange County’s treasurer-tax collector. Let’s accentuate the positive and celebrate that the Fountain Valley Elementary School District has a positive unrestricted net position (UNP). That was cause for the OC Register to find out why. Every school district has a different story. This district has a unique one and it is provided in the first piece below. CalSchoolNews.org also provides its perspective on the fiscal circumstances and also gives Fountain Valley Elementary School District a positive mention. Why do we care? Because the long-term liabilities creating these massive unrestricted net deficits will find that the students currently in these school districts won’t likely see these obligations paid down by the time their children, and maybe their grandchildren, are going to school unless massive budget changes are made now. When public-spending watchdog John Moorlach singled out Fountain Valley Elementary School District as the one and only in Orange County boasting a positive balance sheet, Superintendent Mark Johnson didn’t take the honor personally. In a column that ran last month in the Orange County Register, California State Senator Moorlach wrote that out of the county’s 27 public school districts, only Fountain Valley Elementary is in the black. According to his math, Moorlach said, Fountain Valley Elementary clocks $78 per capita – putting it in the top 10 percent financially of California’s 944 school districts. “It’s all negative after that,” he said. Laguna Beach is Orange County’s “second best” at minus $223. Santa Ana Unified, at minus $1,805, places last. A certified public account, Moorlach found fame after predicting the county’s bankruptcy in 1994. He served as Orange County Treasurer-Tax Collector from 1995 to 2007. Moorlach still enjoys crunching numbers. Over the past few months, Moorlach has been studying the financial soundness of not only school districts but also cities and colleges. For school districts, he scoured online annual financial reports. Then he divided each district’s “unrestricted net position” figure by its population. And only Fountain Valley Elementary, a century-old district that oversees 10 elementary and middle schools, won bragging rights. Serving about 6,300 students, the district has 680 employees. By comparison, SAUSD has 48,000 students and 5,000 employees. Superintendent Stefanie Phillips said that in a larger picture, taking into account other factors than the measure used by Moorlach, the district is solvent and paying its bills. “Are we about to go bankrupt? I don’t think so,” Phillips said with a laugh. Moorlach’s figures “do not represent a balance due,” said Ian Hanigan, spokesman for Orange County Department of Education. Rather, they reflect a change in reporting requirements for public agencies, which, starting six years ago, must report all unfunded liabilities for pensions. “They do, however, signal a need to develop long-range plans (regarding pensions), and this work is already taking place,” Hanigan said. Every district in Orange County, including SAUSD, has a “positive certification” – meaning that each can meet its financial obligations for the current year and the two subsequent years, Hannigan said. Fountain Valley Elementary benefited from “an extremely fortunate” windfall of $35 million from property sell-offs over the first decade of the 2000s, Johnson said. The district held on to one of those properties – “just in case we need it,” Johnson said – and sold the rest. “Then the board made the wise decision to put the proceeds from those sales into a conservative investment portfolio,” he said. Johnson declined to judge the financial prowess of other districts. However, it’s not all luck. The district could have frittered away the initial lump sum “on all sorts of things,” Johnson admitted. CALIFORNIA STATE SEN. JOHN MOORLACH SEES A STORM BREWING FOR CALIFORNIA’S PUBLIC SCHOOLS. The Orange County lawmaker — who serves on the Senate Budget & Fiscal Review Committee and its education subcommittee, and is often credited with predicting Orange County’s 1994 bankruptcy — sounded the alarm in a report last month analyzing financial statements from the state’s 944 K-12 school districts. “The Moorlach Report is a flashing caution light to almost every public education budget in California. Unless things can change quickly, taxpayers can expect new levies, and post-secondary students and parents should fear higher tuition,” according to a press release. • About two-thirds of California’s 944 public school districts run negative balance sheets. These statements show the most distressed districts could soon reach a tipping point into insolvency and receivership. • Of the state’s large school districts, those in severe distress include Los Angeles Unified School District, with a negative $10.9 billion balance sheet; San Diego Unified at negative $1.5 billion; Fresno Unified at negative $849 million; and Santa Ana Unified at negative $485 million, the worst in Orange County. • Of Orange County’s 27 public school districts, only one, Fountain Valley School District, is in positive financial territory. • One bright spot is the 58 county boards of education. At least 51 of them have manageable per capita unrestricted net deficits of -$159 or less, with 14 in positive territory. • Of the state’s 72 community college districts, only one enjoys a positive unrestricted net position (UNP). • Cal State University’s balance sheet is negative $3.66 billion. • The University of California’s balance sheet bleeds red ink all over the state, at negative $19.3 billion. Worse, that will double next year, to $38.6 billion, when retiree medical is included. The early voting results still have me stunned. There are numerous ballots that still need to be counted, but it looks like I’ve lost my seatmate, Sen. Andy Vidak. And, Madera County Supervisor Rob Poythress may have barely lost in his attempt to replace Sen. Anthony Cannella. This means the Republican Senate Caucus is going from 14, enough to stop votes requiring a two-thirds majority, to 12. The next two years do not look good for the Senate Republicans in Sacramento and the taxpayers in California. Now is the time for good fiscal conservatives to join in the debates in the Capitol. School districts are hemorrhaging money and Democrats are beholden to public employee unions. Consequently, the best solutions will not be pursued and you will have to wait for a crisis to fix the mess. 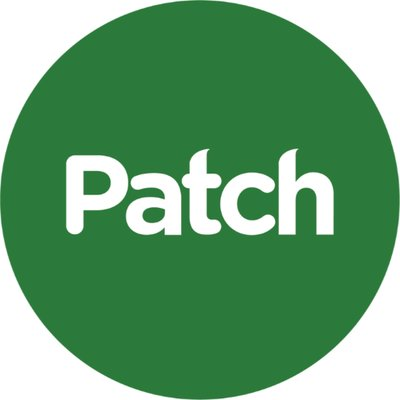 The San Diego Patch provides a review for its readership on the school districts in this beautiful county in the piece below. Get ready for school boards and Sacramento to try everything else to address this fiscal conundrum before doing the right things. In San Diego County, all 17 school districts operating in Patch communities reported deficits ranging from $14 million to $1.5 billion. SAN DIEGO COUNTY, CA — California State Sen. John Moorlach may well be giving an encore performance of his role as the canary in the coal mine preceding Orange County’s bankruptcy almost a quarter-century ago when he correctly predicted financial disaster while a candidate for county treasurer-tax collector. This time Moorlach, a certified public accountant who represents Orange County’s 37th District and serves on the Senate Budget & Fiscal Review Committee and its education subcommittee, isn’t concerned about county government. What bothers him now are the brewing money problems facing hundreds of school districts across California – including in San Diego County – experiencing what he sees as a growing deterioration of their financial stability. Moorlach’s report focused on the Unrestricted Net Position (UNP), an accounting function contained on a school district’s balance sheet portraying what is essentially the net worth of its general fund – the account from which it pays salaries, benefits, administrative costs, maintenance of school buildings and other general operating expenses such as insurance, consulting services and travel. Unrestricted general fund revenues are primarily derived from local property taxes, state and federal financial aid not earmarked for specific – or restricted – purposes and other income such as parcel taxes. In many districts the unrestricted state and federal funding exceeds the amount of property tax revenues. The UNP is just one of three components that in combination provide a detailed picture of just where a district stands financially at the end of its fiscal year. A second component reports the value of capital assets such as school buildings and property after outstanding debt and depreciation has been subtracted – assets that cannot be used for operating purposes. The third category reports assets restricted to federal and state programs such as special education. Most school districts consistently report positive results – or surpluses – in both of these categories. But it’s the UNP that tells school officials just where their district stands when it comes to funds available for paying general operating costs and other expenses. For the majority of K-12 districts in California this significant number is negative, reflecting the fact a district has set aside insufficient assets to pay its obligations – including pension and other retiree benefits. A school district’s UNP is similar in concept to an individual’s personal finances where the value of what is owned such as cash investments, a home, cars and other personal property is subtracted from that what is owed, such as a mortgage, credit card debt and monthly expenses. The difference would be the individual’s net worth, a factor considered by banks when assessing the financial and credit quality of a loan applicant. To provide a more accurate means of comparing and ranking school districts Moorhead divided the UNP deficits by the population in each district to produce a per capita apportionment. In theory this would be the amount each district resident would have to pay over and above existing school taxes to eliminate the general fund deficit in their district. In San Diego County, the per capita UNP in Patch districts ranged from a negative $247 in the South Bay Union High School District to $2,139 in tiny Cardiff School District. “There is simply insufficient funding [for] K-12 to eliminate negative UNP at this time,” said Fine, who agreed with Moorlach that it will get worse before it gets better. On average, over the past six years per-student state funding has grown 13 percent annually, Fine said, but that’s about to change because annual growth rate is expected to be less than 3 percent beginning with the next fiscal year. This level of funding is “a fraction of what is needed to sustain programs and services to students,” said Fine, particularly after you factor in the entire spectrum of expenses incurred by school districts faced with declining enrollments and substantial increases in the cost of special education services. “Every school district has a different and unique story,” says Moorlach. But the common denominator is the growing cost of pensions and Other Post Retirement Benefits (OPEB). Salaries and benefits are major factors contributing to growing UNPs, Moorlach said, and every time districts increase employee salaries, there’s an attendant increase in retirement costs. This particularly impacts districts in areas with high costs of living. San Diego County school districts have growing pension expenses due to the increasing amounts that must be contributed to the California State Teachers Retirement System (STRS) and the California State Public Employees Retirement System (PERS), San Diego County Office of Education spokeswoman Music Watson told Patch. During the past five years for which audited financial statements are available, salaries for teachers and other school employees have increased an average of 25 percent, while the cost of benefits has jumped by an average of almost 50 percent with some individual districts seeing increases in excess of 75 and 80 percent. School districts have little control over the spiraling costs of their annual payments to employee pensions. All districts participate in both the California State Teachers Retirement System (CalSTRS), that provides pensions for teachers and the California Public Employees Retirement System (CalPERS) which handles pension for other district employees. Each year these pension funds calculate the amount each district must contribute, rates that have been steadily increasing because both funds are significantly underfunded. In addition, the state makes contributions “on-behalf” of every district, money derived from California’s own general fund and included in the total amount the state budgets for education. 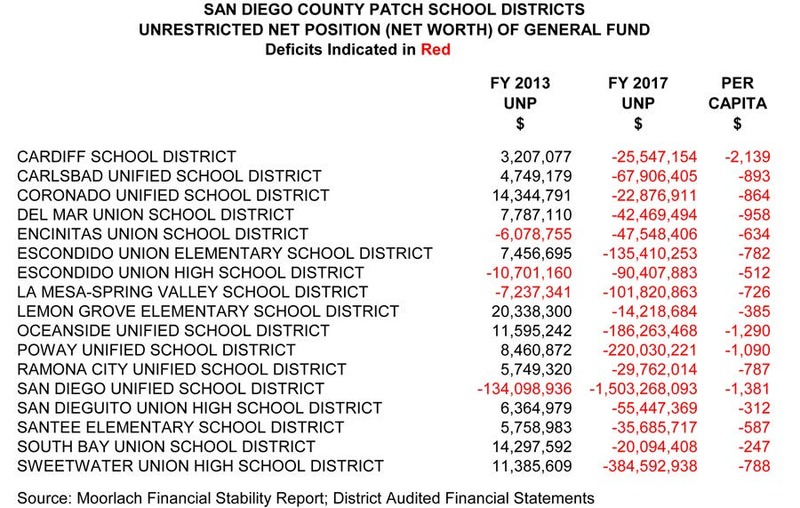 In 2017 direct payments from the state’s general fund to CalSTRS on-behalf of Patch school districts in San Diego County totaled $129.4 million in state payments, themselves contributing $182 million. Combined, pension payments made directly by San Diego County Patch districts to both CalSTRS and CalPERS, over and above the state payments totaled $258.5 million in 2017. While the costs of employee benefits have steadily added to growing UNP deficits, the true magnitude of this subtle erosion in the financial stability of school districts has been hidden in footnotes to annual financial statements most taxpayers don’t bother to read. However, beginning with the fiscal year ending in June 2015, new rules by the Governmental Accounting Standards Board (GASB), an independent organization that sets financial accounting standards for state and local government, required pension liabilities to be included on the actual balance sheets. Almost overnight California school districts were forced to increase their general fund liabilities – a major factor in calculating UNP – by millions of dollars. These numbers will only grow, further deteriorating UNP, when financial statements for the 2018 fiscal year begin appearing in December because those reports will reflect GASB’s requirement that additional millions in liabilities for retiree healthcare and other post-employment benefits must also be included on balance sheets. What Can Be Done To Stem The Red Ink? Moorlach believes one solution is stronger fiscal management. Another might be renegotiating labor contracts to reduce the cost of retiree medical benefits, something that’s anathema to the powerful teachers’ and other public employee unions. To maintain sound fiscal health related to its operating fund, the Poway Unified School District, in collaboration with its employee groups, implemented salary rollbacks in 2010, 2011 and 2012, according to district spokeswoman Christine Paik. The rollbacks were restored in 2013 as the state economy was rebounding, she said. In 2017, the district formed a community-based budget advisory committee to make recommendations around closing the structural deficit in the general fund. “We anticipate continuing with that work this year, including budget workshops with the Board of Education and community budget forums,” Paik said. Oceanside Unified School District is also working to address student attendance and explore ways to bring in more revenue. Attendance has declined at the district for the past decade, according to district Deputy Superintendent Dr. Shannon Soto. “We have a history over the last 10 years of declining enrollment of approximately 400 students every year,” Soto said. Last spring, the district launched a pilot program that allowed students who missed school during the week to make up classes on Saturdays. This year, the district has already scheduled several Saturday make-up days at various school sites. The program enables the district to recoup state funding lost due to student absences. As The Financial Pressures Grow, Will School Districts Start Going Bankrupt? Fine, whose FCMAT staff regularly deals with troubled school districts, doesn’t think so because the state is there to bail them out. Moorlach said he’s not ignoring emergency state financial aid to insolvent districts, he just wonders where the state will come up with the resources to bail out multiple districts which might seek help simultaneously, noting the state’s “rainy day” fund only contains $13 billion. By Bob Porterfield with Patch Editor Kristina Houck contributing to this report. The Sun provides my editorial submission on the public school districts in San Bernardino County. Sacramento will have to be focusing more on how it funds the education of California’s students. As one of three members of the Senate Budget and Fiscal Review Subcommittee One on Education, you can be sure I’ll be encouraging my two Democratic colleagues that action is required and the sooner the better. Of San Bernardino County’s 33 public school districts, only three boast a positive balance sheet. Unfortunately, the other school districts have balance sheets that bleed red ink. The scoring comes as part of my new report, “Financial Soundness Rankings for California’s Public School Districts, Colleges & Universities.” It reviews the financial soundness of all 944 California public school districts. I performed a similar review of California’s 482 cities back in March. The rankings derive from each district’s latest Comprehensive Annual Financial Report, which you can find on their respective websites. In each CAFR, look for the “Basic Financial Statements,” starting with the page titled “Statement of Net Position.” Look at the top row for “Government Activities.” Then look down the column to where it says, first “Net Position,” then “Unrestricted.” That’s the number you want: the Unrestricted Net Position, or UNP. I also divide the UNP by the district’s population to get a per-capita UNP. If negative, that’s the amount each person in the district is in hock for, whether or not your children attend school. Citizens should be concerned about the trajectory of these negative balances, which are commonly attributed to unfunded pension liabilities. As school board members are auditioning for their jobs, they need to be held accountable for dealing with these liabilities. If the negative number runs too high too long, it will mean cuts in teachers, equipment, band and sports, and ultimately calls for tax increases. In the worst cases, takeover by the state, even bankruptcy, is not out of the question. Trona Joint Unified boasts a positive UNP per capita of $6,354, the top for the county and the third best of the state’s 944 districts. Bravo! That’s quite an accomplishment. It’s followed by Baker Valley Unified, at $2,223, the 17th best in the state. Then by Cucamonga Elementary, at $1,842, the state’s 23rd best. Scoring three districts in positive territory, San Bernardino surpasses neighboring Orange and Riverside counties, each of which had just one with a positive balance sheet. That’s the end of the good news. The remaining 30 districts dip into the red. Fourth best in the county is Chaffey Joint Union High, 323rd best in the state at ($462); next is Alta Loma Elementary, ranked 325th at ($465). At least they were in the top third of California districts. Only 10 districts in San Bernardino County were in the top half of the state’s 944 districts. The two lowest-ranking districts were Mt. Baldy Joint Elementary, in 888th place at ($1,688); and Fontana Unified, in 882nd place at ($1,662). While I’m not predicting bankruptcy for these districts, I’m sure everyone in the county is aware of the risks from the city of San Bernardino’s 2012 Chapter 9 filing. For comparison, the city’s CAFR for 2011, the year before it entered a federal courtroom, showed a UNP of ($260.9 million). That put the per capita UNP at ($1,232). But, this was before the unfunded liability for the employees’ defined-benefit pension plan had to be included in the balance sheet. As with the city, the problem with these schools districts being in the red largely rests with excessive pension costs busting budgets. Among the largest districts by population, Chaffey Joint Union High in Ontario ranked 323rd, with a ($462) UNP per capita, Fontana Unified placed 882nd at ($1,682) and Silver Valley Unified placed 880th at ($1,642). In terms of the raw totals of how much these districts are underwater, the numbers are: ($192 million) for Chaffey, ($405 million) for San Bernardino City Unified and ($309 million) for Fontana. That’s nearly a billion dollars for just three districts. The tallies are part of my effort to track the per capita UNPs of California’s various government balance sheets. In addition to the city balance sheets mentioned earlier, I have tracked counties, community colleges, California State University and the University of California as well as all 50 U.S. states. You can follow all these analyses on my legislative website. The reports will be regularly updated. Next year is going to be especially revealing – and distressing – as the Governmental Accounting Standards Board for the first time will require balance sheets to include unfunded retiree medical liabilities, which will show even more city and school districts in critical condition. And when the next economic recession hits, for even those modestly distressed, it’s going to be one big financial train wreck. Let’s hope our elected school board members and their administrative staff get in front of this serious cash management squeeze on their horizon. It’s time to be proactive, as taxpayers are not very forgiving with those who are reactive. Especially with supposed leaders who only have one solution: raise taxes. I’ve given you the status of the unrestricted net position (UNP) of California’s 944 school districts in prior UPDATEs this year (also SEE REPORT HERE). Patch has taken this study and provided a very professional review of the data and what it portends in the piece below. It also had knowledgeable quotes from Mike Fine, formerly the Chief Business Officer for the Newport-Mesa Unified School District and someone I worked with starting a quarter-century ago. Such is the joy of having been involved in local government leadership positions for more than two decades, you build and maintain relationships. Shortly after predicting the fiscal calamity that the County of Orange endured, I was appointed to serve as the Orange County Treasurer-Tax Collector three months after the County filed for Chapter 9 bankruptcy protection. In this position I enjoyed serving as the Treasurer for all of the county’s school districts. That’s why this project is so important to me. I want our kids and their schools to succeed, and proper fiscal management is a critical component of the success formula. The closing remark says it all. We know we have a problem, so let’s get proactive in addressing it. Especially in Sacramento, where it is likely to come crashing through the Capitol’s front door, figuratively speaking, when funds will be needed (and probably at a time when it will not have any). NEWPORT BEACH, CA — California State Sen. John Moorlach may well be giving an encore performance of his role as the canary in the coal mine preceding Orange County’s bankruptcy almost a quarter-century ago when he correctly predicted financial disaster while a candidate for county Treasurer-Tax Collector. This time Moorlach, a Certified Public Accountant who represents Orange County’s 37th District and serves on the Senate Budget & Fiscal Review Committee and its education subcommittee, isn’t concerned about county government. What bothers him now are the brewing money problems facing hundreds of school districts across California, all experiencing what he sees as a growing deterioration of their financial stability. In Orange County all but one of the 27 school districts reported deficits ranging from $7 million to nearly half a billion dollars. Of these, 14 school districts are located in Patch communities, and only one of those, the Fountain Valley Elementary School District reported positive results. Moorlach disagrees, saying he’s not “sure this is a generalization one should hang their hat on. “The deeper the negative UNP, the more likely there are higher annual payments for pensions and retiree medical. Higher annual payments ‘crowd out’ other expenses, like programming and supplies,” he said. The third category reports assets restricted to federal and state programs such as special education. Most school districts consistently report positive results – or surpluses — in both of these categories. In the Orange County Patch districts Moorlach’s study found this per capita amount ranged from a positive $78 in Fountain Valley to $1,089 in Newport-Mesa Unified. “There is simply insufficient funding [for] K-12 to eliminate negative UNP at this time” said Fine, who agreed with Moorlach that it will get worse before it gets better. On average, over the past six years per-student state funding has grown 13% annually, Fine said, but that’s about to change because annual growth rate is expected to be less than 3% beginning with the next fiscal year. “Every school district has a different and unique story,” says Moorlach. But the common denominator is the growing cost of pensions and Other Post Retirement Benefits (OPEB). Salaries and benefits are major factors contributing to growing UNPs, Moorlach said, and every time districts increase employee salaries, there’s an attendant increase in retirement costs. This particularly impacts districts in areas with high costs of living, such as Orange County. Orange County teachers tend to have higher salaries and therefore a “greater share of the California State Teacher Retirement System’s Unfunded Liabilities,” the Orange County Department of Education spokesperson Ian Hanigan told Patch. There may be light at the end of the tunnel for Orange County school districts, as those liabilities are expected to “level off” based upon higher contributions by employers who “hope to improve the outlook for the state’s pension systems,” Hanigan said. During the past five years for which audited financial statements are available, salaries for teachers and other school employees have increased an average of 25% while the cost of benefits has jumped by an average of almost 50% with some individual districts seeing increases in excess of 75 and 80%. In 2017 direct payments from the state’s general fund to CalSTRS on-behalf of Patch school districts in Orange County totaled $89 million in addition to the $141.2 million the districts’ collectively paid from their own funds for teacher pensions. Combined, pension payments made directly by Orange County Patch districts to both CalSTRS and CalPERS, over and above the state payments totaled $193.7 million in 2017. Moorlach believes one solution is stronger fiscal management. Another might be re-negotiating labor contracts to reduce the cost of retiree medical benefits, something that’s anathema to the powerful teachers’ and other public employee unions. As the financial pressures grow will school district start going bankrupt? Bob Porterfield, with Patch Editor Ashley Ludwig contributing to this report. Now I’m providing the results of our Unrestricted Net Positions (UNP) research just for the 23 school districts in the county of Riverside. My submission is provided below in the Inland Valley Daily Bulletin and the Redlands Daily Facts. Of Riverside County’s 23 public school districts, just one, tiny Desert Center Unified, boasts a positive balance sheet. Unfortunately, the other school districts have balance sheets that have dipped into the red. Desert Center Unified’s positive number clocks at $3,055 per capita. For comparison, it ranks 38th of California’s 944 school districts, an exemplary performance. Yet I must point out it teaches just 23 students with a staff of two. It’s all negative after that around here, with the second and third “best” being Perris Union High at ($528) and Perris Elementary at ($556). At least they were in the top half of California districts, although that’s not saying much. The worst are Coachella Valley Unified at ($1,946) and Romoland Elementary at ($1,864), ranking 904th and 903rd of the state’s 944 districts. They languish in the bottom tenth of districts. Among the largest districts by population, Corona-Norco Unified ranks 820th at ($1,359), Riverside Unified 727th at ($1,089) and Moreno Valley Unified 745th at ($1,118). In terms of the raw totals of how much these districts are underwater, the numbers are: ($380 million) for Corona-Norco, ($291 million) for Riverside and ($204 million) for Moreno Valley. That’s a combined deficit of almost $1 billion for just three districts. Overall, just five Riverside County districts ranked in the top half of California’s districts, but 18 ranked in the bottom half, a truly alarming performance. Next year is going to be especially revealing — and distressing — as the Governmental Accounting Standards Board for the first time will require balance sheets to include unfunded retiree medical liabilities, which will show even more city and school districts in critical condition. Let’s hope our elected school board members and their administrative staffs get in front of this serious cash management squeeze on their horizon. It’s time to be proactive, as taxpayers are not very forgiving with those who are reactive. Especially with supposed leaders who only have one solution: raise taxes. When I get mad, I get motivated. That’s probably why I’m in public office. When I did a little research and realized what then-Orange County Treasurer-Tax Collector Robert L. “Bob” Citron was doing, I got mad. Mad enough to step out of my comfort zone as a partner in a large local C.P.A. accountancy firm, Balser, Horowitz, Frank & Wakeling, and run against him, unsuccessfully, in the June 1994 primary (see https://www.ronbluecpa.com/location/orange-county). Well, I’m watching the financial status of California and its municipalities crumble and everyone seems to either be ignoring it or putting their heads in the sand. What to do? There is no singular and accessible public repository to find the Comprehensive Annual Financial Report (CAFR) for every municipality. So, my office decided to create it. We went to every school district website or contacted the districts (two or three still haven’t provided them). We also received exceptional assistance from Marc Joffe at Reason Foundation by helping us track down a few of the stragglers. Since my stint as Chairman of the Orange County Board of Supervisors in 2012, I’ve been reviewing California county CAFRs and taking their Unrestricted Net (Assets or Deficit) Position (UNP) and dividing it by its population. The per capita UNP is a very reliable indicator of the fiscal status of a municipality and allows us to compare them apples-to-apples (or, in the case below, oranges-to-oranges). The UNP should be positive (net assets), but more than likely it is negative (net deficit). We reviewed the 482 cities earlier this year because I was mad. I’ve been drafting and presenting pension reform legislation and most of the cities, with the exception of those in Orange County, have been largely disengaged on this ever-increasing millstone. What to do? Show everyone how all of the cities are doing. It’s having an impact. The third and fourth editorial pieces below are recent columns from the Culver City Observer. The columnist gets it. Not only for the city, but for the city’s school teachers (see MOORLACH UPDATE — City CAFR Rankings – Vol. 1 – February 7, 2018). Just wait until the columnist finds out that Culver City Unified is #831 out of 940 — ouch (see MOORLACH UPDATE — California School District Rankings, Group 13 — August 28, 2018). The second piece below announces our most recent review of the CAFRs for the 944 school districts in California. As a few have combined to save on auditing fees, we have 940 on the list. The Orange County Breeze, in the second piece below, provides the overview from our press release. I have had the pleasure these past few years of serving on the Senate Budget and Fiscal Review Committee and its Subcommittee No. 1 on Education (see https://sbud.senate.ca.gov/subcommittee1). When I’m told by representatives of our state’s CSU and UC systems that they cannot provide me with a ten-year Strategic Financial Plan, I get mad. When I hear that teachers in LA voted to go on strike, I get mad. Don’t these people know how desperate their employer’s CAFR is? And, that it will be worse when the June 30, 2018 audits are completed thanks to the now required inclusion of retiree medical liabilities? So, as an involved and committed elected official, I rolled up my sleeves and, with my staff, started digging. Regretfully, the data we obtained is not encouraging and the trend lines are not going in the right direction. What to do? It’s time to be proactive! Now! If California’s elected leaders continue to hesitate, then being reactive will be too late and too ugly. The first piece below is my editorial submission on this most recent school CAFR repository project. To be honest with you, the numbers were so bleak it impacted me emotionally. I was truly saddened to reveal the results of our simple metric. You’ve already seen them by my releasing 14 volumes of data in the month of August. The OC Register gave me an opportunity to expound on Orange County’s 27 public school districts. If anything, I hope you get mad, too. And, get out of your comfort zone and do something to improve the situation. Volunteer for a campaign. Contribute to a candidate. Put up a yard sign. Even start doing the research to see if you should be a candidate yourself someday. We’re leaving a massive mess to our children, grandchildren and great-grandchildren. Please, get motivated. Of Orange County’s 27 public school districts, just one, Fountain Valley Elementary, boasts a positive balance sheet. Unfortunately, the other school districts have balance sheets that have dipped into the red. The scoring comes as part of my new report, “Financial Soundness Rankings for California’s Public School Districts, Colleges & Universities.” It reviews the financial soundness of all 944 California public school districts. I performed a similar review of California’s 482 cities, including Orange County’s 34 cities, back in March. In that case, 19 O.C. cities ran positive balance sheets, although 15 ran red ink – a much better performance than for the school districts. Fountain Valley Elementary’s positive number clocks at $78 per capita. For comparison, it ranks 102nd of California’s 944 school districts. It’s all negative after that, with the second and third “best” being Laguna Beach Unified at ($223) and Fullerton Joint Union High at ($344). By far the worst is Santa Ana Unified at ($1,805), a very dangerous number. It ranks a dismal 901st of California’s 944 school districts. Oddly, the next two places of financial distress are held by districts in wealthy OC communities, Irvine Unified ($1,115) and Newport-Mesa Unified ($1,089). This is part of my effort to track the per capita UNPs of California’s various government budgets. In addition to the city budgets mentioned earlier, I have tracked counties, community colleges, California State University and the University of California as well as all 50 U.S. states. Sen. John Moorlach released his latest fiscal report, “Financial Soundness Rankings for California’s Public School Districts, Colleges & Universities.” SEE REPORT HERE. It follows his March 2018 reports on the state’s 482 cities that found 2/3 of them in the red; of 58 counties, 55 suffered deficits and only three enjoyed positive balance sheets. His May 2018 report on the 50 U.S. states found only nine were financially healthy, with California ranked among the worst, in 42nd place. Editor’s Note: Los Alamitos Unified School District is ranked 426, Savannah Elementary School District is ranked 408, Cypress Elementary School District is ranked 423, and Anaheim Union High School District is ranked 463. In an ironic twist, a recent study by the nonprofit Bellwether Education Partners has found that the rising costs of teacher pension plans are starting to eat into their own salary hikes. Teachers, and their unions, often complain about low salaries. The research from Bellwether shows that, since 1994, teacher salaries have failed to keep pace with inflation. But total compensation for teachers has risen faster than inflation when non-salary benefits, such as insurance and retirement, are included. Chad Aldeman, an associate partner at Bellwether, says lack of money isn’t why teacher salaries aren’t rising. “Even after adjusting for inflation and rising student enrollment, total school spending is up,” Aldeman reports. Aldeman notes that teachers have the highest retirement benefits of almost any profession. in retirement compensation,” Aldeman’s report says. To be fair, teachers pay part of their salary into a taxpayer-backed pension fund. When the fund does well, retired teachers do too. But when the fund doesn’t make its financial goals, a deal that California lawmakers signed years ago essentially requires other state residents to make-up the difference—usually through higher property- or sales-taxes, like the ones that Culver’s government officials and its employees want you to approve in November. Culver City is listed by State Sen. John Moorlach as being in one of most egregiously worst financial positions of the 482 cities that recently filed documents with Sacramento. Meantime, our Council just moved $10 million from the City’s reserve fund, setting aside those funds by placing them into an irrevocable trust and making them only available to pay for City employees’ retirements. This financial move should reassure City employees nearing retirement that their hefty pensions will be paid. But what does the Council’s newly formed trust really do to alleviate the almost $4,000 tax burden for every man, women and child in Culver City who don’t work for our local government? Can little Culver City continue to pay super-large paychecks and pensions to current and former City employees? If so, local taxes will need to continue to rise. No, I’m just not pointing the finger at our Police and Fire departments, but other City agencies as well. Our City Manager’s total of money and benefits is now over $400,000 annually, and some local government employee’s will never see the inside of a discount store because they’re collecting more than $175,000 in retiree pensions. On Nov. 6, Culver City voters will be asked to approve another $187 annual property-tax to fund the School District plus a sharp increase in the City’s sales tax. If our local government can’t reign in its spending now, it’s a safe bet that there will be more taxes to come in future years. I just guess I would feel better if we had a better system. After all, it’s been more than 100 years that Culver City has been functioning but has never had one lady in the firehouse. Isn’t it possible to create a separate classification for paramedics, like so many other departments throughout our country have done? Surely, our Council should wake-up and change this poo-poo policy before our City is sued. Continuing the Culver City’ Observer’s policy of informing the public of our dire financial situation: State Sen. John Moorlach, R-Costa Mesa, has listed all 482 cities in California based on their current financial situation and outlook for the next few years. Culver City ranks 478, just five up from the bottom. With 40,000 residents, every man, woman and child in our community would have to pay $3,979 each to pay our City’s expenses. Sen. Moorlach’s comprehensive study found that Culver’s financial position today is even worse than that of Bell and Maywood—and most of us know how those two cities turned-out. Moorlach has already gained the support of several anti-tax groups, including the Howard Jarvis Taxpayers Association, which grew out of the 1970s property-tax revolt, and the National Tax Limitation Committee. For additional information, visit Sen Moorlach’s web site at http://www.moorlach.cssrc.us or call his Orange County Office, (714) 662-6050. California State Controller Betty Yee spoke on Sept, 22 at a South County Labor meeting that I attended. A group of about 400 activists from several trade unions and candidates for political office were there. Yee and I had a long conversation on my suggestions to continue to improve financial transparency in California cities and counties. It’s probably only a matter of time before improvements will be mandated by Sacramento. At our table were Veronica Sauceda, candidate running for L.A. Superior Court Judge No. 4 (www.Saucedaforjudge.com) and Patricia Hunter (www.pattihunter4judge.com/), candidate running for L.A. Superior Court Judge, office No. 16. Please vote for both Hunter and Sauceda. In my opinion, they will be fair and have integrity. With so many dozens of brand-new teachers with little or no real classroom experience having been hired by the Culver City Unified School District in the past three years, one would think that the district’s average cost of its teaching staff would be much lower. But, if you check out the CCUSD/CCFT negotiated Collective Bargaining Agreements on the district’s website covering this school year and the last one, you’ll find that the average compensation cost (combined salary and benefits) per teacher is $91,775 and under the CCUSD/CCFT collective Bargaining Agreement on Health and Welfare, it shows that the average cost of a teacher’s health and welfare is $5,222. To find the teachers’ average salary, you would simply have to subtract the district’s average health and welfare costs from the teachers’ average compensation. In doing the math, you would come up with $86,553 as the teachers’ average salary–not the ridiculously low figure that Bruce Lebedoff Ander gave in his recent letter that was printed in the Observer. His is almost $20,000 off- the-mark. It may have been $67,270 at one time, but that was probably a long time ago. Wasn’t it five years ago when some current board members agreed to a five-year plan to give district-wide staff a raise that, at the time, was of an unknown size? They helped pay for it by taking millions of dollars out of our School District’s reserves, and that, its final district costs turned out to be almost $20 million. That was the equivalent of giving district staff an unprecedented 30 percent salary increase. But, that’s not even counting the district’s annual Step & Column’s increases of 3 percent to 4.1 percent for teachers with less than 10 years of service in the district. For those fortunate teachers, their salary increases could well have been between 45 percent and 50 percent over the last five years. Now, Bruce Lebedoff Ander certainly has the right to express his own opinion of me. But hopefully, next time when he tries to throw around monetary figures, he will check the accuracy of his sources before putting out such wildly untrue and misleading information into the public discussion. 3) The city clerk races. Republicans are provided. Incumbents are noted and listed. If they are Democrats, there is an asterisk (*). Candidates with two asterisks (**) are Declined to State. Candidates in bold are endorsed. Those in italics are good second choices. Capistrano Bay Community Services District does not have a website, so write in a teenager in order to get this municipality up to speed. This November, California voters will decide whether to authorize a $4 billion infusion to existing affordable housing programs for veterans and low-income residents. Supporters of Proposition 1 say it will help address the state’s housing crisis. Opponents of the measure say it does nothing to cut the regulatory red tape that slows building in California and that the state can’t afford to take on more debt. Forum takes up the debate and examines the possible effects of Proposition 1. This is the third of three Voter Guide editions for Orange County’s 27 school districts (for the first, see MOORLACH CAMPAIGN UPDATE — School District Races (#27 – #19) — October 11, 2018 and for the second, see MOORLACH CAMPAIGN UPDATE — School District Races (#18 – #10) — October 12, 2018). This is the top third of school districts based on their Unrestricted Net Deficits in the county and the state. It’s the piece below (see MOORLACH UPDATE — LAUSD vs. OC School Districts — September 18, 2018). Because we’re focusing on the finances, for this grouping it is an opportunity for you to thank the incumbents and to encourage them to continue improving the situation. Accordingly, I’ve provided the names of the incumbents, regardless of party affiliation. One asterisk (*) signifies that the candidate is a registered Democrat. No asterisk means they are a registered Republican, and should be a safe vote. If the name is in bold, I have endorsed. If in italics, they are a good vote for the position. This group has two districts with no candidates this cycle. For the ballot measures, see MOORLACH CAMPAIGN UPDATE — 2018 Ballot Measures — September 21, 2018. For statewide races, see MOORLACH CAMPAIGN UPDATE — Statewide Voter Guide — September 24, 2018. For local Federal, State and Countywide races, see MOORLACH CAMPAIGN UPDATE — Federal/State/OC Races — September 26, 2018. This is the second of three Voter Guide editions for Orange County’s 27 school districts (for the first, see MOORLACH CAMPAIGN UPDATE — School District Races (#27 – #19) — October 11, 2018). This is the middle third of school districts based on their Unrestricted Net Deficits in the county and the state. It’s the piece below (see MOORLACH UPDATE — LAUSD vs. OC School Districts — September 18, 2018). Because we’re focusing on the finances, this is one opportunity for you to ask the incumbents what they’ve been doing to improve the situation. Accordingly, I’ve provided the names of the incumbents, regardless of party affiliation. One asterisk (*) signifies that the candidate is a registered Democrat. No asterisk means they are a registered Republican, and should be a safe vote. If the name is in bold, I have endorsed (which I have not done in this grouping). If in italics, they are a good vote for the position. This group has four districts with no candidates this cycle. The blanks for areas means there are no Republican candidates. Letters to the Editor in support of Proposition 6 and giving me a polite shout out continue to appear around the state. The second piece is from the Los Angeles Daily News. The third is from Calaveras County’s The Pinetree.net. Vote yes on Proposition 6. For years, politicians in Sacramento have been raiding existing gas-tax revenue to pay for pet projects and general fund spending — not to fix our terrible roads and infrastructure. State Senator (and CPA) John Moorlach released a report showing that only 20 percent of existing gas tax funds go to roads, and Caltrans wastes half a billion dollars annually on extra staffing. And as with most supplemental taxes, we can’t help but suspect this one indirectly offsets debt accumulated from unsustainable public-employee pensions. Copperopolis, CA…The cost of living is already too high in California, and the Gas and Car Tax hikes hurts working families that already struggle to pay bills. Estimates suggest the new increase in Gas Tax total will cost a typical family of four $779.20 or more per family, per year. This is about what a family spends on Christmas and two years of school lunches at a public school, or a year of college textbooks. • The tax also hits business owners who rely on transporting goods, raising the cost of everything from apples to bread and everything in between. • On Nov 1, 2017, Californians became subject to an additional tax of 12.5 cents more per gallon of gasoline (and 20 cents more for diesel), also increasing auto registration fees as much as $175 a year – striking the wallets of hard-working families across the state. The gas tax hike will NOT fix our roads – because politicians will continue to fraudulently raid and divert gas tax funds. This latest gas tax increase contains NO GUARANTEE that even a penny will go to roads. • For years, the Sacramento politicians have been raiding the existing Gas Tax funds to pay for their pet projects and general fund spending rather than fixing our terrible roads and infrastructure. • By voting Yes on 6, you send a message to the Sacramento politicians that Californians want raids of our existing gas tax funds stopped immediately. • Prop 69 did not end the raids of existing gas tax funds and allows the governor to spend gas tax money to fund budget shortfalls. 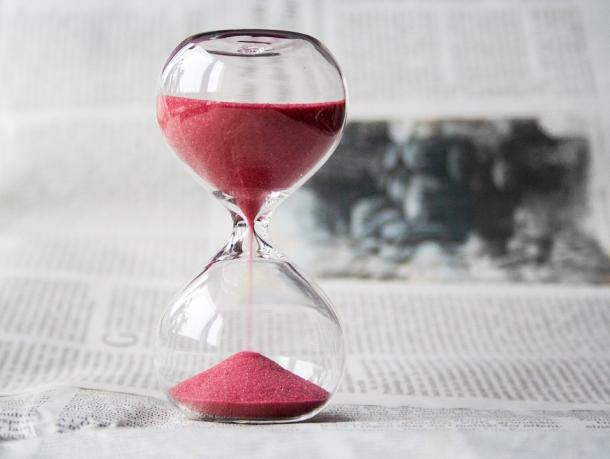 • State Senator John Moorlach – a CPA – released a stunning report showing that only 20% of existing gas tax goes to roads and Caltrans wastes half a billion dollars annually on extra staffing. • A 2016 study by the Reason Foundation shows that California spends 2.5x national average on roads. • All the road projects that the politicians are claiming are being paid for by this most recent Gas Tax could be paid for if the politicians used the existing gas tax revenue for doing what it was supposed to do – repairing California’s infrastructure. • Nobody is denying that California’s roads are crumbling, but there’s plenty of money to repair the roads if the politicians put 100% of the existing gas tax revenue into doing the right thing.